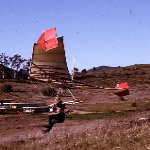 US Hawks Hang Gliding Association • View topic - I need a scrapped Falcon or Alpha glider! Do you know of a wreaked WW Falcon or Alpha glider somewhere that the owner would part with cheaply? To prototype my "HG Basic Trainer" design (see other thread) I would like to cannibalize a scrap Wills Wing glider for the small components. Or even the king post and control bar for what is still good in them. It would be very expensive for me to buy all new components from WW and there is no reason to use new parts, because the prototype trainer will not be sold to anyone. I will be using all new tubing for structural parts, so it doesn't matter how badly the wreaked glider is broken up and bent and I don't need the sail if it is missing.